Many homeowners choose gutters based on shape. 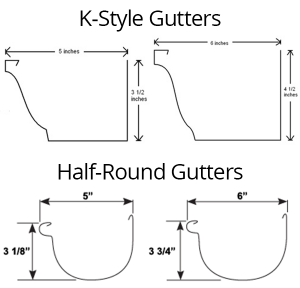 Two fairly common shapes available on the market are “K” shaped and half-round shaped gutters. The K-shaped variety is common in most modern styled homes. They have the appearance of letter “K” when viewed sideways. They are more cost effective than the half round type due to their wide availability. Half round shaped rain gutters can be found in old historical homes. They have a more appealing look and style than the K-shaped variety and are easier to clean due to the inner smooth shape and the fact that they have fewer crevices that may easily trap debris. Plastic - This is usually durable vinyl that is not only long lasting but inexpensive too. Aluminum - This is one of the most common materials used to make gutters. Aluminum gutters are rust resistant, cost efficient, and can easily be painted in your preferred color. Steel - Galvanized steel gutters are in fact the most economical option for a homeowner. The material is strong enough to hold up against heavy debris such as small tree branches and lasts longer than the rest. However, steel is not rust resistant but can be coated with a sealant to prevent rusting. 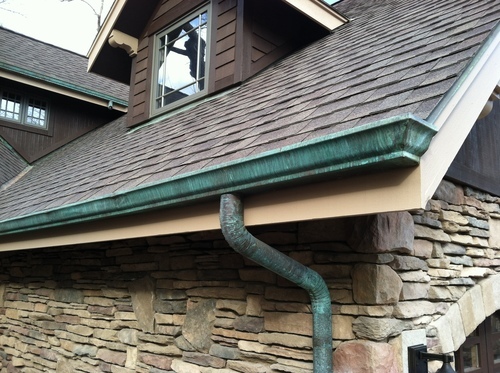 Copper - Copper gutters are not quite common but they are found in some homes. They are usually orange in color but in time they weather to a light green color known as patina. This type of gutters is mainly used for decorative purposes in most homes. However, it is quite durable and is even said to last for as long as 100 years. Wood - Though not a top option for homeowners, wooden spouting does indeed look attractive. It however does not hold water as efficiently as the other types of gutters and demands regular maintenance including annual oiling, sealing, and staining. When considered in the long run, wooden spouts or gutters are quite expensive despite being attractive. Gutters meant for residential homes are generally available in a 5-inch size. Larger sizes are also available. Remember the larger the gutter size the more water it can hold. However, large gutters hold more snow and ice during winter and can easily tear away from the home structure when the load becomes too much. There are other individual features a homeowner may want in a gutter such as downspout extensions and if the gutter is seamed or seamless. It all depends on your personal preference. The most important thing to remember is that gutters are a long-term commitment so think about issues such as cost and durability when you seeking for replacement. It is also important to ensure your gutter system is always free from debris clogs and regularly cleaned to extend its lifetime.